This past Saturday I woke up early (awesome) and decided to go cozy up with myself downstairs in mine and the cat's favorite chair. I've recently begun printing my blog--at long painful last-- and I'm really excited about it. And feel a sense of relief. That's a lot of material to just leave hanging intangible in internet oblivion. So I found a website that is easy, does everything for me, and is nothing fancy which is just what I was looking for. I have to do it in intervals though because it's quite a bit of content there. So I do it by year. I was reading 2009 and without comments or pictures (my pictures don't start to work until mid 2010) it's 92 pages. And what strikes me whenever I read back is how funny I think I was, compared to now, which then bums me out exceedingly. I still think I'm decently-humored, but I don't write like how I used to. And I miss it. Just slapping up stuff off the cuff, silly little nothings about my day. Random thoughts or things I'm noticing that I feel warrant my public commentary or that make the day mean a little more, stand out for a specific reason or two. The general lightheartedness. And by gol, I think the world needs more of it. So I'd like to try to go back to my blogger roots. To see if I'm really not as stale as I feel. Yes I've grown but I'm wary of really growing UP, because I still laugh at what I wrote. I cringe at times as well, but the laughs outweigh the shudders. So I'm going to give it a try at least. 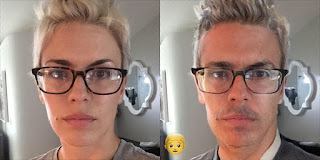 What I'm seeing is they thinned his frames a bit (so he's cool but not TOO hipster), lengthened my face a bit, giving him a sliiightly more square'ish jaw (slightly, for my jaw is decent already), kept my nose the exact same, added some greys and scruff and then put a suit jacket on me/him?? Anyway, busts me up. I feel like I know him from somewhere... it's a little disconcerting. Hmm, guess I better never get old, because that makes me look terrible. It gave me nice hair as a girl, though. Ha! If you want to make yourself real sad, have your kids do it and see them be teenagers before your very eyes. I'm afraid to try this out... 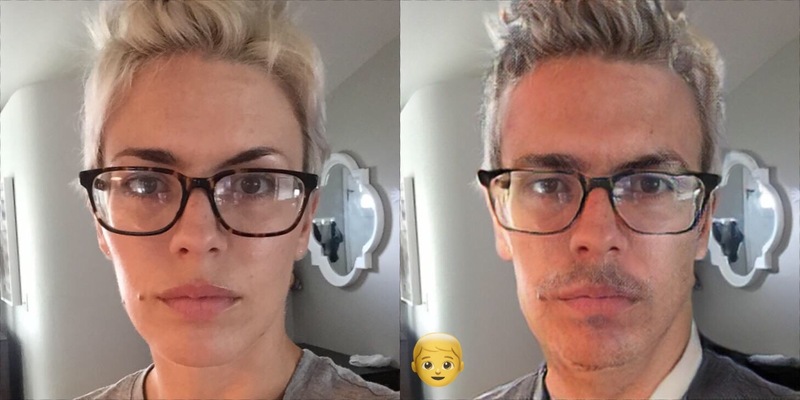 I don't know that I want to see what I'd look like as a man! But I love that you also re-read your old blog posts-- I sometimes worry that the fact that I enjoy doing this makes me terribly narcissistic. Can I help it if I find myself so entertaining? But I've been falling into the trap of only sharing pictures of my kids on my blog. This isn't the worst thing-- it's a great record for my family-- but that isn't what I intended when I began blogging. Time to get back to those roots! Man-Jen is starting to creep me out. Anthony bourdain meets the guy from divergent? I mean, anything we post is good, right? At least as some form of record-keeping. But yeah I can't help but notice a difference from the old days and I am reluctant to let them go. Maybe it's Instagram, I don't know. I got on that soon after I moved; maybe there's a correlation here. But anyway, let's keep going.